It started with the wearable magnetic pincushion featured here on July 10, 2005, then morphed into the magnetic wristband of October 13, 2005, capable of handling screws, nails, nuts and bolts. A couple years out back in the skunk works and it grew like Topsy. 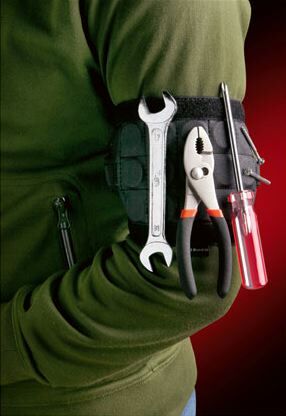 The Tool Band-It easily wraps around your arm, with strong adjustable Velcro bands and powerful rare earth magnets. Even heavy metal tools stick securely to the band so you don't have to twist or reach for screwdrivers or wrenches — or use the magnets to hold your tools against a metal ladder or the side of a tool cabinet. They're already out back in the skunk works working on Version 2.0, which I'm told will also take your blood pressure. I know what would happen to me - I'd either stick myself to the garage door or I'd roll over under the car and collect all the swarf and junk.